Vermont Valley Community Farm was founded in 1994. We (Barb and David) and our three children moved from Madison’s isthmus to the Town of Vermont with the sole purpose of starting a CSA. The beauty of the area, proximity to Madison and good soil for growing vegetables were instrumental in our decision. Our goal was to leave our city jobs and become full time farmers. This goal was realized in 3 years. We had 50 CSA members our first season (mostly loyalty from the near east side!). The CSA membership grew incrementally until we reached our peak in 2009 with 1250 shares. Our focus has always been on CSA, we believe strongly in this model. All of the food we grow on the farm gets distributed to our CSA members. We do not sell at the farmer’s market or to restaurants and have sold just a few select items to Willy St Coop over the years. It is very important to involve our members and encourage them to come out to the farm. As we head into year 23 we are grateful to the Madison community for the incredible support! Vermont Valley Community Farm came to be because of Barb’s and my desire to return to the country combined with a grand experiment to see if people would support our efforts to create a farm following the Community Supported Agriculture (CSA) model. I grew up on a traditional southern Wisconsin diversified family farm; went on to earn a degree in Agriculture; and entered the pesticide dependent world of agriculture as an Agronomist. Disillusioned by this system, I shifted to the political world and spent many years working in our State Capital, where I was exposed to the politics of agriculture. It is here that I converted to organic agriculture and began to look for a new model; one that made sense for both farmers and eaters. 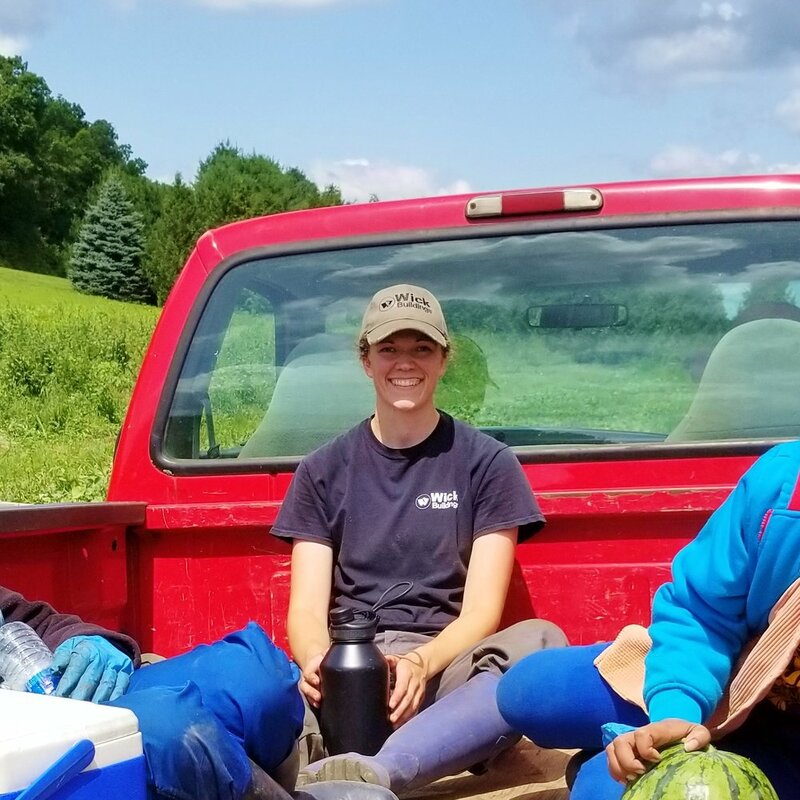 The grand experiment to start a CSA farm is a grand success thanks to thousands of people who have put their food dollars into our hands and thanks to the hard work of the hundreds of people who has been part of this farm over these two decades. The best part of the farm is the comments we get from our members thanking us for what we do; it lets me know we’ve made the right choice. So what do I do on the farm; initially everything; then someone else takes over a task; my load is much lighter now. You are most likely to find me in the field tilling, planting or cultivating; but when time allows, I may be seen sailing on Lake Mendota. This farm and I have grown up together. I’ve nurtured every aspect of this place and in turn it has grown up to be a rather large and independent 23 year old. Sometimes I feel as if the farm has taken on a life of its own and I am here to support it. On a daily basis I manage the labor crews and am responsible for the harvest and all aspects of getting the food from field to share box. I love working with a wide diversity of people (the sociology major in me) and love a challenge (that would be every day!). My years working in the non-profit world prepared me for managing a CSA; juggling many tasks at once and feeling as if there is not quite enough time to get it all done, although it always gets done! It is incredibly special to work with my children and their partners. Who would have imagined all of this 23 years ago? I have been working at Vermont Valley Community Farm since my parents, Barb and David, started the farm 23 years ago. I worked summers through college and began working full time after I graduated from UW-Madison in 2005. I have been part of almost every aspect of the farm, but now I spend a lot of time working with machinery and irrigation. I manage harvest and planting crews as well. I am also in charge of our seed potato business. Away from the farm I like to spend time with my two kids, Paavo and Mischa. I also like to be outdoors running, hunting and fishing. This is my tenth year as the Office Manager at Vermont Valley Community Farm. I design and manage our websites as well as handle sales, distribution, communications, and member services. My husband, Jesse, and I live near the farm with our two children, Paavo and Mischa. The aspect of my job that is most fulfilling is my role as Donations Coordinator. Placing excess produce into schools, community centers and food pantries brings our community mission full circle! When I am not in the office I work in the packing shed and with the field crews. Outside of farm life, I am a competitive trail runner and love traveling with my family. I grew up on the near east side of Madison and spent my early adult years in Madrid, New York and Paris. I have worked on this farm, with my family, since 1994. As the packing shed manager I manage the cleaning, bagging and bunching of the produce. I keep the walk in coolers organized and record all of the produce that is harvested. It’s great on Thursday morning to see the result of our work as we pack the boxes and the trucks for delivery! I also do harvesting, lawn mowing, occasional tractor work and wood splitting. When I'm not working in the winter I snowboard and cross country ski. In the summer I like to mountain bike. I studied abroad in Costa Rica for a year and am fluent in Spanish. I started this season as a worker share, but when additional help was needed, David and Barb asked if I was interested in coming on full time, and I was excited to accept. It's pretty cool to have a job where you get to be a part of so many aspects of planting, growing and harvesting such a large variety of vegetables, and to see the culmination of your work when the shares are delivered each week. When I am not at the farm, I spend a lot of time with my family, including cooking dinner with the veggies from the share on Thursday nights! For fifteen years we have had a crew of Cambodian Americans working with us seasonally, full time. This group of people came to the United States as refugees after the Vietnam War. They settled in Madison in the 1980’s. As an agrarian group of people, working with the land and with vegetables is a perfect fit. Many are family and all of them are a tight knit community. Some speak English, some don’t. They work hard, laugh a lot and get a lot of big jobs done fast. They are a lot of fun to work with.